The warm climate makes California a near perfect place for Zinfandel wine grapes to grow. Zinfandel thrives in the Golden State despite it having true roots in Croatia. It is widely believed that Zinfandel showed up first in California during the Gold Rush in the mid 1800s. Since then, it has expanded into one of the most prevalent wines in the state with a presence across Northern California. According to the Wine Institute, Zinfandel is the third-leading wine grape in California with “more than 47,000 acres planted and 355,599 tons crushed in 2014”. Grilled and barbecued meats (pork, beef, ribs, you name it). At Mt. Vernon Winery, we are proud of our 2012 Estate Zinfandel. 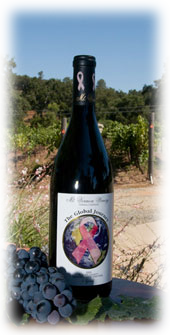 This wine features juicy raspberry, stone fruits with zippy bright acid and a robust, fruity finish. Our Estate Zinfandel has been dry farmed for more than 10 years.